We all have stories that live in our hearts. Stories we come back to over and over again for inspiration, comfort, and assurance that we do make a difference. 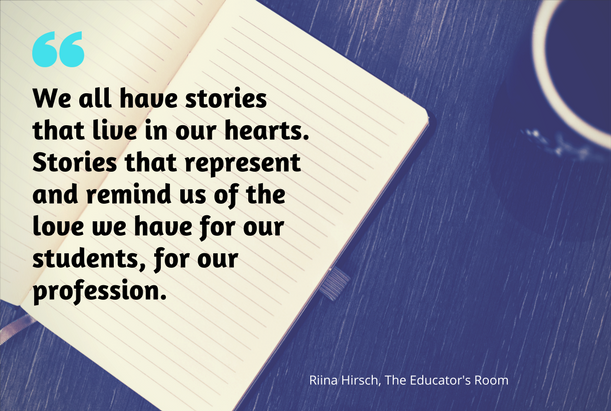 Stories that represent and remind us of the love we have for our students, for our profession. One of my favorite stories is from early in my teaching career–year three or four, I think. At the time, I was working for a charter school. The school was populated largely by students who had no alternatives left; students who had been expelled from other schools or were escaping negative peer situations. None of that is really relevant, though. This is the story about the first time a student mistook me for his mother. This particular young man was incredibly sweet but lacked the common sense God gave a rock. For the purposes of this story, his pseudonym will be Derrick. Derrick, as you can imagine, was constantly getting himself into trouble–mostly because of his aforementioned lack of sense. After a particularly disruptive episode, Derrick was assigned to our In School Suspension room. The program was run by a red-faced ex-marine with a penchant for yelling. While he was extremely effective at maintaining order and was able to establish positive relationships with many students, Derrick and he had a contentious history. I, on the other hand, had developed an extremely positive relationship with Derrick. Don’t ask me how; I think he had a crush on me. Finally, Derrick came to the phone. By this point, I was beyond irritated, so as soon as Derrick answered, I snarled “What is wrong with you today?! ?” Derrick, caught completely off guard by my tone, responded with “Huh?” Now, those who have worked in urban settings may be aware that “huh” was the height of disrespect when responding to an authority figure for several years. As angry as I was, I lit into that child with a passion I am almost ashamed to acknowledge. I, as the saying goes, tore him a new one. I berated him for embarrassing me and himself with such vehemence that the 30 odd students in my classroom sat completely silent and awed as I spat into the phone. After a few minutes, I wound down and took a deep breath. I still smile just thinking about that moment. As soon as the words were out, my anger dissipated completely. It took every ounce of willpower I possessed not to laugh out loud as I realized what poor Derrick had just experienced. You see, to him, I represented a complete enigma. His mother frequently asked him what was wrong with him–a fact I knew well once I thought about it. Mr. B had told Derrick he was calling me, but when I asked him what was wrong with him, he became completely confused. He recognized my voice, but the phone and the question combined to convince him that his mother was on the phone berating him. His unintended response to his confusion was “huh.” As I yelled at him, he became aware of who was on the phone and realized his error. His apology was sincere…and hilarious. My class must have sensed that the danger had passed because movement, sound, and work (I hope) reignited. Derrick went on to have a trouble free day in ISS, and life continued. For me, this moment is priceless. It represents the depth of feeling I have for my students, and the depth of the relationship we often form. How precious is the thought that a student might know me and I him and his family so well that such a confusion could surface. How deep the trust must have been for him to openly admit what had happened to him and then apologize! It seems silly and perhaps far-fetched, but it is moments like these I return to when I need a reminder that most of what teenagers do that seem so cunningly designed to aggravate us is rarely malicious, or even intentional. I often have to pause when confronted with a situation that irks my nerves and re-consider what motivates the behavior that has pushed me over the edge. It doesn’t always work, because, let’s be honest, sometimes I see red and can’t regain perspective in the moment. But I strive to keep this story in mind. And almost every time I do, I am able to keep a moment of frustration from becoming a catastrophic power struggle. Instead, my temper in check, we can explore how the student and I can make better choices in the future. This wasn’t a particularly important or profound moment. It wasn’t a story anyone else would likely remember or find important. It is; however, a story that has lived in my heart. I hold on to that story as a reminder of how powerful we are in the lives of our students.